Logo Mega Pack - Logos & Templates for Adobe Photoshop & Elements | Mac App Storeのアプリ検索・ランキング BuzzMac! LOGO MEGA PACK for Adobe Photoshop give you stunning, high-resolutions, 300 DPI Photoshop Logo Templates and Logo Objects! - COMMERCIAL USE ALLOWED! NOTE: YOU MUST HAVE PHOTOSHOP TO USE THIS PRODUCT. 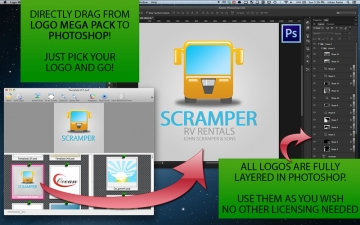 SAVE TIME BY USING PRE-DESIGNED LOGO TEMPLATES! DON’T SPEND HUNDREDS OF DOLLARS FOR 3 OR 4 LOGO CONCEPTS FROM AGENCIES AND DESIGNERS. 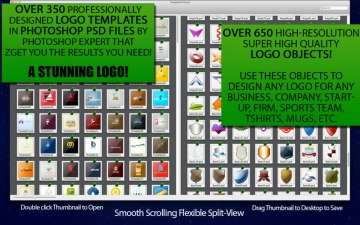 LOGO MEGA PACK Templates are the highest quality and the best looking Logo Templates anywhere! Even on the App Store! Satisfaction Guaranteed! 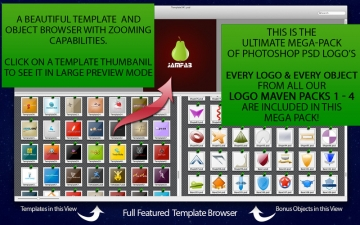 Logo’s can be opened in any editor that support PSD files (for layer compatibility) such as Adobe Photoshop, Adobe Illustrator, Adobe Fireworks, even open-source Gimp! NOTE: All Graphic Source Files are Provided. ANY Logo or Templates can be changed to any Industry or Category you want! NOTE: Mega Pack is the full bundle of all 4 of our other Logo Maven Packs. What make Logo Mega Pack Photoshop Logo Templates Unique? ✔ 350 Pre-Designed Logo Templates---> Cant ask for more Logo Concepts that this! 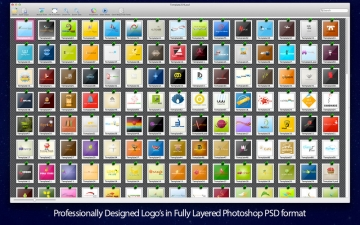 ✔ 600+ Objects & Logo Elements--->Create 1000'S of more Logo’s with these Objects! ✔ Fonts Included---> No more Missing fonts messages in Photoshop! - Click the Font button on the toolbar! ✔ Fully Layered--->No Flattened Layer! ✔ 300 DPI Photoshop Logo Files--->Print Ready! 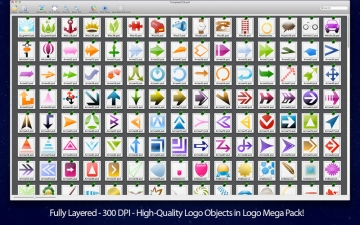 ✔ Multitude of Categories to Mix and Match ANY Object to Create ANY Logo! ✔ ALWAYS HAVE YOUR LOGO TEMPLATES IN A KNOWN LOCATION, IN THE APP! 2. If you find anything that you want to change or fix, please let us know and we’ll fix it or make it right to your satisfaction. Just email us! Check out our other Packs in the App Store!